I've been reading quite a bit lately with summer vacation well under way, and a few days ago when I was in a local bookstore just looking around for something good to buy (in the fantasy section at the time), I realized that is actually a harder task than what it might first appear to be. I mean, you're in a bookstore right? Isn't that the spawning ground of good books or something? Using my very humble opinion (this is my blog! I can do whatever I want! Mwhahahaha! ), I would like to share some of the books I stumble across and read. Perhaps I will write a review, or maybe I will juts give a nutshell idea of what the book is all about. I like to think they will all be in good taste, but also that they are either just really good stories, or prove to be "changing" to some degree. Anyway, onto the book! Don't hurt me with copyright or anything! I'm just a kid! I didn't know! Now if there was a book to start this segment off with a bang this would definitely be it. 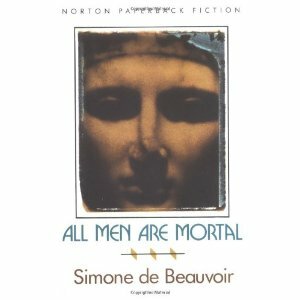 Written by Beauvoir (A French woman born in the early 20th century), this book really has it all (except for vampires, sadly). Among the many awesome things Simone de Beauvoir was (feminist, activist, philosopher, intellectual), she also was a writer whose work was greatly influenced by the school of thought known as existentialism. "A philosophy that emphasizes the uniqueness and isolation of the individual experience in a hostile or indifferent universe, regards human existence as unexplainable, and stresses freedom of choice and responsibility for the consequences of one's acts." I kind of think of it in simpler terms and the question of "why are we here?" Really, what is the point of us being here? I'm not a philosopher, but I know this question has been pondered by all great thinkers throughout time, as well as the rest of us probably at some point. From cave-people to famous philosophers, this question is ingrained in us. Some people look to a God for the answer, some just search themselves. It doesn't matter, because it is a universal question. And it is a question that should be asked again and again until the day we die, because even if we never conclude an answer for ourselves, just thinking about this question is what actually matters. Anyway, more about the book. The setting takes place sometime in the early-ish 19th century, in Paris, featured around the endeavors of the young and beautiful actress Regina. But Regina is more than some up-and-coming star who struggles to scrape a living. She is fantastic, and everyone who watches her shows and all of her friends love her. Everyone, including Regina, are certain that she is heading to the top and will become famous. However, this is not enough for Regina. To be famous is not enough. After all, when you are nothing but dust in some grave what does it matter that people once thought you were brilliant? This idea consumes Regina, who strives to be greater than all the women around her, including her co-actor and nemesis Florence. Simply put, she wants to be Queen. She wants to be eternal in her greatness. She is used to attention, she is used to being praised, and she is accustomed to being considered amazing by everyone around her. This suffices for a time. Then she meets he mysterious Raymond Fosca. Now I won't go into details, but essentially Fosca does not pay one ounce of attention to Regina. Gradually he begins to notice her, as Regina pesters him constantly (anyone who refuses to notice her undermines her more than anything), and the two become an interesting pair. Regina, the woman who must be the greatest and recognized by all as such, and Fosca, the guy who doesn't seem to give a damn about much of anything (especially not Regina for some time). And why is Fosca this way? Well, he is immortal (this isn't a spoiler it's on the back of the book and revealed very early). His life has spanned centuries, and to him, Regina is just a woman among millions of others; always the same. But to Regina this presents the opportunity she has always wanted: to be remembered. Before her is a man who will live forever, therefore one who can carry her memory forever, and that is all that matters for Regina. To never be forgotten. The story soon switches to the retelling of Fosca's life, through his memories, and needless to say questions regarding the purpose of our existence cannot help but arise. They are basic existentialist themes and ideas, but what's wrong with that? Every human can relate to this book. And it isn't a book filled with five hundred pages of philosophical babble. It's about the life of Raymond Fosca! All 600 years or something like that, filled with battles, betrayal, love, remorse, science, religion...everything! (except vampires). Read this book! It will make you think about what truly matters, and what it means to be alive. Couldn't agree more about the majoriyt of books on store shelves-unfortunate situation. But good books do exist. Great post! Extremely helpful info specially the final part :) I handle such info a lot.